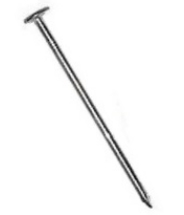 1 inch Electro-Galvanized Roofing Nail, 50 lb. Box. Price/box. (.120 Inch / 11ga Shank, 3/8 Inch Head, About 12,500 Nails Per Box). 1-1/2 Inch Electro-Galvanized Roofing Nail, 50lb. Box. Price/box. (.120 Inch / 11ga Shank, 3/8 Inch Head, About 8,800 Nails Per Box). 2 in. Electro-Galvanized Roofing Nail, .120 In. 11ga Shank, 3/8 Inch Head. 50lb./Box (about 8800/box). Price/Box. 2 in. Electro-Galvanized Roofing Nail, .120 In. 11ga Shank, 3/8 Inch Head. 50lb. Boxes (about 8800/box). 48/Pallet. Price/Pallet. 2-1/2 in. Electro-Galvanized Roofing Nail, .120 Inch / 11ga Shank, 3/8 Inch Head, 50lb. Box (about 6100/box). Price/box. 3 in. Electro-Galvanized Roofing Nail, .120 Inch / 11ga Shank, 3/8 Inch Head, 50lb. Box (about 4650/box). Price/Box. 3/4 in. Electro-Galvanized Roofing Nail, .120 Inch / 11ga Shank, 3/8 Inch Head. 50lb. Box (about 15,600/box). Price/Box. 3-1/2 in. Electro-Galvanized Roofing Nail, .120 Inch / 11ga Shank, 3/8 Inch Head. 50lb. Box (about 5,000Box). Price/Box.